Assistant coach Greg Sutton. Photo from Flickr. It is not surprising to see the names of former professional athletes sprinkled around many Concordia Stingers teams as coaches. One of those names is Greg Sutton, a professional soccer player, who just recently retired from the Montreal Impact in late October. Sutton’s 14-year career as a professional footballer saw him represent teams such as the Chicago Fire, Toronto FC, the New York Red Bulls and, finally, the Impact, on two separate occasions. The Hamilton, Ont. native was drafted by Chicago in the second round of the 1999 MLS College Draft. In his rookie season, Sutton made his debut, coming on as a substitute against the San Jose Clash on June 19. Sutton kept a clean sheet and earned his first professional victory. Following Chicago, Sutton played for the Montreal Impact when they were still in North America’s second division. Sutton was a fan favourite and collected many awards guarding the Impact’s goal. He won the USL championship in 2004 and was named league MVP in the same year. Sutton was also named Goalkeeper of the Year for four years in a row, beginning in 2003. In 2007, he joined Toronto FC in their first season in the MLS. Toronto FC was the first Canadian professional team to make it to North America’s top league. Sutton was happy to be in Toronto as he is now part of Canadian soccer history. A few years later, he found himself back in Montreal, where he would ultimately end his career. Sutton spent the end of the 2011 season on loan with the Impact and later became a permanent member after signing a contract in 2012. During his career, he also had a chance to represent the Canadian National Team 16 times between 2004 and 2009. 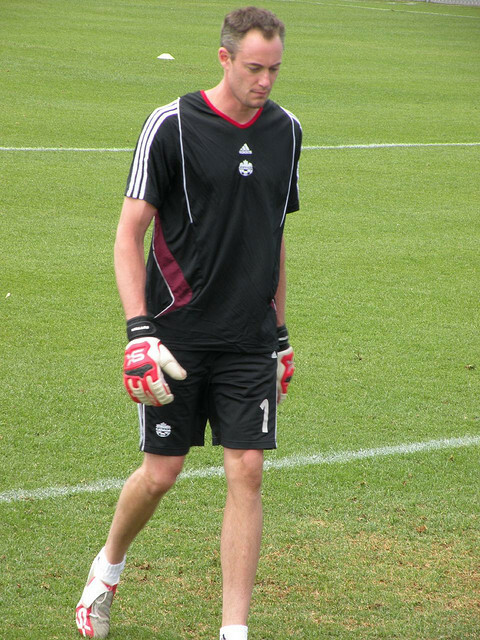 Sutton made his debut for Canada on Jan. 18, 2004 in a one-nil win against Barbados. He was also included in three of Canada’s Gold Cup squads, a tournament that only involves North American countries. In September 2012, while still a member of the Impact, Sutton joined the Stingers as an assistant coach on the men’s soccer team. The team is currently coached by Lloyd Barker, a former Impact player as well, who is a good friend of Sutton’s. After a few months with the team, Sutton believes Concordia has a bright future ahead when it comes to soccer. “We’re starting to see more and more players go through the system, but it’s a cycle obviously,” he said. “Hopefully we can continue to grow the team and the game itself at Concordia. When asked about his future behind the Stingers’ bench, Sutton is still unsure about his plans for 2013.